1 Rookie Autogramm per Box !! 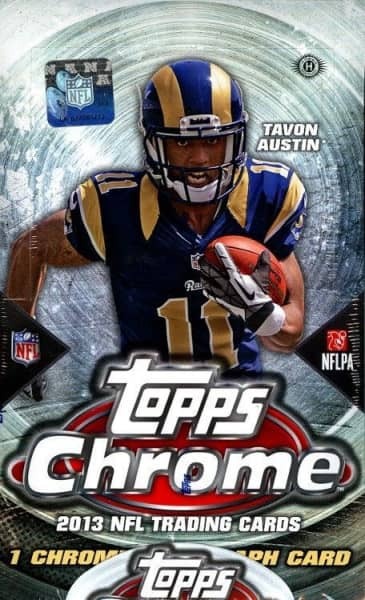 Produktinformationen "2013 Topps Chrome Football Hobby Box NFL"
Highlighting the most sought after NFL rookies and veterans on dazzling Chrome technology! Up to 30 rookie subjects featured on a limited Chrome 1969 Topps Football design. Featuring ON-CARD autographs on refractor technology. Hobby Exclusive. Up to 35 rookie subjects showcased on the 1959 Topps Football design. Up to 35 rookie subjects displayed on the 1986 Topps Football design. Up to 30 rookie subjects highlighted on the 1965 Topps Football design. - Blue Wave Refractor (220 subjects) NEW! - Prism Refractor Parallel (220 subjects): Seq #'d TBD. 1 per box. Hobby Only NEW! Weiterführende Links zu "2013 Topps Chrome Football Hobby Box NFL"
Fanbewertungen für "2013 Topps Chrome Football Hobby Box NFL"